New visitors want to know who you are and why they should care. This makes your ‘About’ page one of the most important pages on your website as it is often here new visitors go before further engaging (subscribe, support, buy, etc) with your site. Despite this, the ‘About’ page is in many cases left unattended, down prioritized (compared to e.g. the home page) or even left out entirely. So here’s 9 10 ideas to help you craft a better ‘About’ page. In some cases the reader have more questions or inquires. 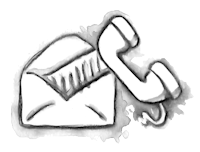 By putting your contact info directly on the about page you make it dead simple for the reader to contact you. If you have a dedicated ‘contact’ page with multiple ways of contacting you, then at least link directly to it from the about page. Show a real image of your team. Show a real image of you or your team. This is where you show the curious reader that the website isn’t created by a robot – that there’s actually living humans behind it. Avoid generic stock photos of people at all costs. A $5 stock image of a suit-wearing businessman, delivers no value to the reader – it obviously isn’t you they are seeing on the image. In fact, MarketingExperiments did an a/b test concluding that irrelevant stock photos don’t result in any conversion improvement. Logo swap test by Freshpeel. “We strive to be number one by having excellent performance, deliver outstanding value to our customers, and by offering world renowned services..” and on it goes. Such a statement could fit any company. The reader wants to know about you and your company, not the goal of any given company in the industry, so don’t wast his time by writing descriptions that would also fit on any other of your competitors ‘about’ page. A simple test is to replace your name and logo with your competitors – if the about page still works then it’s too generic. While Gary Vaynerchuck is good at making bite-sized content, his about page isn’t exactly easy to scan. Readers visiting your about page wants to know about you and your site in a snap, but without easily scannable content they will have to read through your entire ‘About’ page (see image) to find the information they are looking for. So make it easy for your visitors to find just what they are looking for by dividing your about page in to bite-sized chunks, with easily scannable headlines so they can quickly proceed to your other pages. Show a map of your office location. Knowing where a business or website owner is geographically located is a very simple way to further add to the site’s credibility. You can of course just write your address, but consider also including a small map. While a map might be of little practical use for sites where the reader would never have any interest in going to the actual place, it can still be a good idea to include it simply because it’s an image that can help spice up an otherwise text dominated about page. Also, if the reader don’t know the written address - e.g. if he comes from another city, state or country - then a map can make the address seem real. 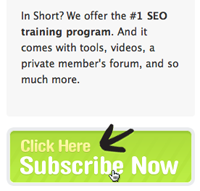 SEO Book urges you to subscribe to their training program after reading their ‘About’ page. When the reader has seen your about page, give him an easy way to further engage with your site. This may be subscribing to your blog, signing up for your service, or buying your products. Whatever it is, link to the most obvious places to go for such actions. When visit your about page and reading through it the visitor shows interest. Make it easy to further develop his relationship with you. Show off your merits and why you are capable of doing your special thing. This way you give people a reason to trust you with their time, and in the long run, personal info and money. If the about page is for a business, don’t be afraid to give a single hint about who you are in private “also an avid golf player..”, “prefers scotch over beer”, etc. This gives your brand a certain level of intimacy, which is critical online where everything is otherwise distant, sterile and mechanic. 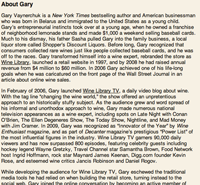 If the about page is for a personal blog or similar, the entire about page should of course be in this style. Imagine that the reader have just entered your site for the first time, and have no prior knowledge of what you do. Before going on about what you really do that’s unique, it can be a good idea to state what may seem obvious, “we’re a publishing group..”, “audiophile loudspeaker company..”, “full time wine blogger..”, etc. This is a good starting point for an about page. Simply answer the question “what do you do?” in a simple and concise manner. Be describing ‘why’ you are doing what you do, you clearly point out what makes you unique. This is the perfect way to differentiate yourself from all the others out there, and inform the reader about your philosophy and approach to things. The ‘why’ is what makes people care about you. It sets you apart from your competitors – to some in a good way, to others in a bad way. The danger online is obscurity, not critics. Do you have other ideas or tips for crafting a good ‘About’ page? Then share them in a comment. Authored by Christian Holst. Published on April 14, 2011. 10) Use hyperlinks in your about page (added by David Eccles). Ensure that you use hyperlinks in your about page too. This is the place to start sending people off to content that they are interested in. It’s weird how many sites don’t use hyperlinks in their content, relying instead on navigation. Some really good tips here, especially the personal photo, which I have now shared. 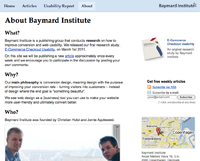 I have found that the About Us page is one of the most frequented pages on a website. Lots of great tips, helped a lot. Thanks for writing it.